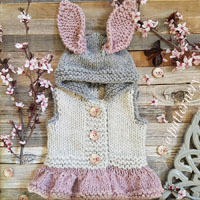 Go to original pattern for design DROPS Baby 18-9. DROPS CIRCULAR Needle size 4.5 mm [US 7] (60 cm [24’’] for all sizes + 40 cm [16’’] for the 2 smaller sizes) – or size needed to get 20 sts x 26 rows in stockinette st = 10 x 10 cm [4’’ x 4’’]. DROPS DOUBLE POINTED Needles size 4 mm [US 6] – or size needed to get 21 sts x 42 rows in garter s = 10 x 10 cm [4’’ x 4’’]. 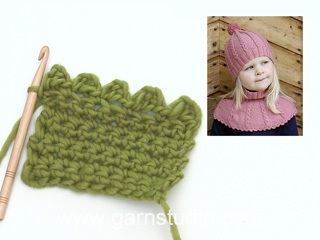 You can get the yarn to make this pattern from	16.80$. Read more. BUTTONHOLES: Make buttonholes on right front piece. 1 buttonhole = K tog 2nd and 3rd st from mid front and make 1 YO. Make buttonholes when piece measures 29-32-37 (40-45) cm [11 3/8”-12½”-14½” (15¾”-17¾”)] and 32-36-41 (45-50) cm [12½”-14¼”-16 1/8” (17¾”-19¾”)]. Cast on 144-160-176 (196-208) sts on circular needle size 4.5 mm [US 7] with Merino Extra Fine. Insert 1 marker each side (= 72-80-88 (98-104) sts between markers on front and back piece). K 1 round, P 1 round and continue in stockinette st. When piece measures 5 cm [2’’] dec 1st on each side of both markers – SEE DECREASING TIP – and repeat the dec on every 5-6-7 (8-9) round a total of 10 times = 104-120-136 (156-168) sts. When piece measures 25-28-33 (36-41) cm [9¾”-11”-13” (14¼”-16 1/8”)] dec 12-16-20 (28-28) sts evenly on round (dec an equal amount of sts on front and back piece) = 92-104-116 (128-140) sts. P 1 round and now continue in moss st – SEE ABOVE. When piece measures 27-30-35 (38-43) cm [10 5/8”-11¾”-13¾” (15”-17”)] bind off 6 sts each side (= 3 sts on each side of both markers), and complete front and back pieces separately. BACK PIECE: = 40-46-52 (58-64) sts. Continue in moss st, AT THE SAME TIME bind off to shape the armhole each side at the beg of every row: 1 st 3 times = 34-40-46 (52-58) sts. 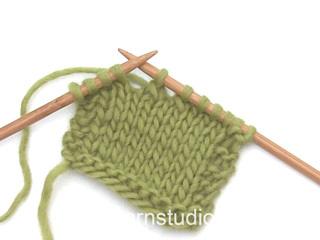 When piece measures 34-38-44 (48-54) cm [13 3/8”-15”-17¼” (19”-21¼”)] bind off the middle 16-18-20 (20-22) sts for neck and complete each side separately. Bind off 1 st on neckline on next row = 8-10-12 (15-17) sts left on shoulder. Bind off when piece measures 36-40-46 (50-56) cm [14¼”-15 ¾”-18” (19 ¾”-22”)]. FRONT PIECE: = 40-46-52 (58-64) sts. Insert a marker between the 2 middle sts. Continue in moss st and bind off for armholes each side as described for back piece. AT THE SAME TIME when piece measures 28-31-36 (39-44) cm [11”-12¼”-14¼” (15¼”-17¼”)] divide piece in two from RS as follows: Slip sts from the side and up to 2 sts before marker mid front on a stitch holder, and continue on remaining sts for right front piece. RIGHT FRONT PIECE: = sts on left side of piece as seen from RS + 2 sts to the right of marker mid front. Continue in moss st and continue dec for armhole. When dec for armhole are complete there are 19-22-25 (28-31) sts on row. 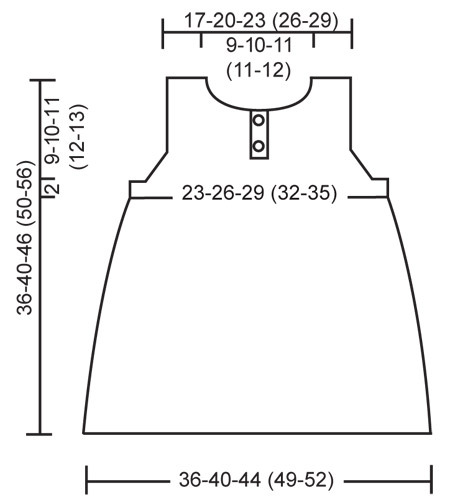 When piece measures 29-32-37 (40-45) cm [11 3/8”-12½”-14½” (15¾”-17¾”)] make buttonhole – SEE ABOVE. 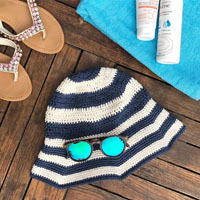 When piece measures 33-37-42 (46-51) cm [13”-14½”-16½” (18”-20”)] bind off to shape the neckline at the beg of every row from mid front as follows: 5-6-7 (7-8) sts 1 time, 2 sts 2 times and 1 st 2 times = 8-10-12 (15-17) sts left on shoulder. Bind off when piece measures 36-40-46 (50-56) cm [14¼”-15 ¾”-18” (19 ¾”-22”)]. LEFT FRONT PIECE: Slip sts from stitch holder back on needle and pick up 4 sts on the back of the first 4 sts towards mid front on right front piece. Continue as described for right front piece, but without the buttonholes. ASSEMBLY: Sew shoulder seams and sew on buttons to fit buttonholes. CROCHET BORDER: Crochet a border round neckline, armholes and along bottom edge with crochet hook size 3.5 mm [US E/4] as follows: * 1 sc, 3 ch, 1 dc in the first of these 3 ch, skip 1 cm [½’’] *, repeat from *-*, and finish with 1 sl st in first sc from beg of round. Worked in garter st. Beg with the sole as follows: Cast on 14-17-19 (23-27) sts on double pointed needles size 4 mm [US 6] with Merino Extra Fine and work garter st back and forth on needle – SEE ABOVE – for 4-4-4½ (5-5) cm [1½”-1½”-1¾” (2”-2”)]. Now pick up sts round the sole as follows: 6-8-9 (10-11) sts along each short side and 14-17-19 (23-27) sts along cast on row = 40-50-56 (66-76) sts. Round begins at the beg of cast on row. Work garter st in the round – SEE ABOVE – for 2-2-2 (3-3) cm [3/4”-3/4”-3/4” (1 1/8”-1 1/8”)]. Work next round as follows: bind off the first 10-12-13 (15-16) sts, work the next 14-18-21 (26-33) sts and then slip them on a stitch holder (= heel), bind off the next 10-12-13 (15-16) sts and keep the last 6-8-9 (10-11) sts on needle (= upper foot). 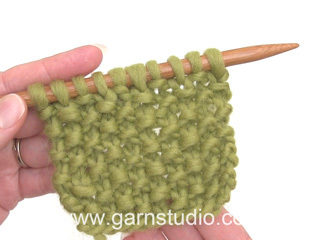 Work garter st back and forth on needle for 4½-5-5½ (6-6½) cm [1¾”-2”-2¼” (2 3/8”-2½”)], and then bind off. Slip sts from stitch holder back on needle = 14-18-21 (26-33) sts. Work 2 cm [3/4’’] garter st back and forth on needle. At the end of next row from RS cast on 14 new sts for strap = 28-32-35 (40-47) sts. Work garter st on all sts, AT THE SAME TIME after 1 cm [3/8’’] make 1 buttonhole at the end of strap as follows: K tog 3rd and 4th st from edge and make 1 YO. 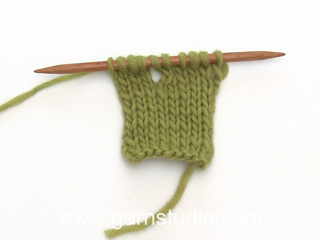 Continue in garter st until strap measures 2 cm [3/4’’] and bind off. ASSEMBLY: Sew the upper piece to bootie both sides, edge to edge with small, neat sts – leave an opening measuring approx ½-½-½ (1-1) cm [1/4”-1/4”-1/4” (3/8”-3/8”)] between upper piece and edge at the back. Sew on button to fit buttonhole on strap. LEFT BOOTIE: Like right bootie, but when casting on new sts for strap, cast on at the end of row from WS in order to have the strap at the opposite side . Ich bin beim Vorderteil und habe bei der linken Seite ein Problem. Wenn ich alle Zu- und Abnahmen genauso wie in der Anleitung beschrieben durchführe, habe ich oben zuviele Maschen um ordentlich mit dem Rückenteil zu vernähen. Was mache ich falsch? Liebe Claudi, für den rechten Vorderteil hatten Sie 4 M mehr als die stillgelegten Maschen für den linken Vorderteil - für den linken Vorderteil stricken, Sie die stillgelegten Maschen und fassen Sie 4 M hinter die 4 ersten Maschen vom rechten Vorderteil = so bekommen Sie die gleiche Maschenanzahl. Viel Spaß beim stricken! Hej Laura, prøv at stryge kanten forsigtigt, med et fugtigt viskestykke imellem. Held og lykke! Vielen Dank! Dann habe ich noch eine Frage zum Vorderteil links: was bedeutet hinter dem rechten Vorderteil 4 Maschen aufnehmen? Liebe Maria, dieses Video zeigt, wie man diese Maschen aufnehmen wird (die Maschenanzahl wie in der Anleitung folgen). Viel Spaß beim stricken! Ich stricke für 12 bis 18 Monate, beim Rückenteil: nach abketten für das armloch sind 46 Maschen übrig, dann seht, die mittleren 20 abketten, dann eine gegen den Hals=12 Maschen, das ist dann pro Seite, oder? Vielen Dank! Liebe Maria, ja genau, es sind 12 M übrig für jeden Schulter. Viel Spaß beim stricken! Hej, den första markören sätter du innan den första maskan i början på varvet. Noch eine Frage: ich habe 176 Maschen, dann soll man alle 7 Reihen je eine, also insgesamt zwei Maschen, abnehmen und das 10 Mal (2*10= 20), das wären dann 156 Maschen, in der Anleitung steht, es bleiben 136 übrig? Danke! Liebe Maria, es werden insgesamt 4 M abgenommen, dh 2 M auf beiden Seiten beiden Markierungen: 176 M - (4 M x 10 ) = 136 M übrig. Viel Spaß beim stricken! Ich stricken für einjährige. Wenn steht, jede 7 te Reihe soll sie Abnahme wiederholt werden, zählt man dann die Reihe mit der Ersten Abnahme mit? Danke! Liebe Frau Gold-Tajalli, nach der 1. 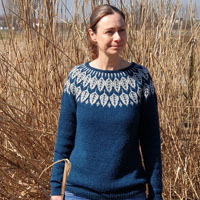 Reihe mit Abnahmen, stricken Sie 6 Reihen und bei der nächsten Reihe (= 7. Reihe), nehmen Sie ab. Viel Spaß beim stricken! Décidément, lorsque je tricote un modèle Drops Design, ce n'est jamais simple...bon, les modèles sont beaux et gratuits...faut pas se plaindre...je tricote ce modèle en taille 12-18 mois et dès les 1ères diminutions, il devrait y avoir 40 mailles en moins pour les 4 marqueurs. Il y a une erreur après les 10 diminutions, il devrait rester 136 mailles pour la taille 12-18 mois et non pas 125 mailles tel qu'indiqué. Bonjour Mme Beaumier, il y avait une faute de frappe qui a été désormais corrigée, merci. Bon tricot! Sie können das Kleid nach der Fertigstellung auf eine flache Unterlage legen unter feuchten Tüchern trocknen lassen oder das Kleid auf einer geeigneten Unterlage mit Stecknadeln feststecken, mit einer Sprühflasche anfeuchten und dann trocknen lassen, bevor Sie die Stecknadeln entfernen, damit sollte Abhilfe geschaffen sein. Außerdem wird sich das Kleid beim Tragen auch noch etwas aushängen.